A newspaper article published by The Central Florida Press on June 20, 1930. The article reports that the Sanford Atlantic National Bank had declared a dividend of $1.50 during a meeting of the board of directors held on June 17. 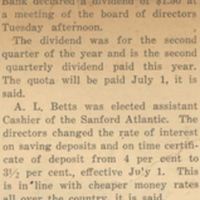 According to the article, A. L. Betts was elected assistant cashier and that board of directors had lowered the interest rate on saving deposits and on time certificates. The article also reported that the interest rate on call loans in New York had dropped to 2.5 percent, showing that an abundance of money was available for safe investment. The bank was Originally established in 1928, but was later renamed the Atlantic National Bank of Sanford in 1974. In 1978, the bank was renamed the Atlantic National Bank of Seminole. In 1981, the bank was acquired by the Atlantic National Bank of Florida, was moved to 101 East First Street, and became a branch of the First Union National Bank of Florida. Original newspaper article: "Melon is Cut by Bank Directors: Sanford Atlantic Bank Declares a Dividend." The Central Florida Press, Vol. 1, No. 9, June 20, 1930, page 1: Oviedo Historical Society, Oviedo, Florida. Digital reproduction of original newspaper article: "Melon is Cut by Bank Directors: Sanford Atlantic Bank Declares a Dividend." The Central Florida Press, Vol. 1, No. 9, June 20, 1930, page 1. "Institution History for SANFORD BRANCH (720933)." National Information Center. http://www.ffiec.gov/nicpubweb/nicweb/InstitutionHistory.aspx?parID_RSSD=720933&parDT_END=99991231. Sanford Historic Preservation Board. "The Sanford Historic Preservation Board Presents The Sanford Historic Downtown Walking Tour." City of Sanford, Florida. 2009. http://sanfordhistory.tripod.com/Links/wtour.pdf. “Melon is Cut by Bank Directors: Sanford Atlantic Bank Declares a Dividend.” RICHES of Central Florida accessed April 19, 2019, https://richesmi.cah.ucf.edu/omeka/items/show/5683.